WordPress powers 33% of the internet. With over 45,000 themes and plugins, it is the world’s most popular content management system. Every month, WordPress certified and published by Bitnami on AWS is launched tens of thousands of times. When a user launches an application certified by Bitnami, they are confidently launching the most up-to-date and secure version of the application. Bitnami’s expertise in packaging reliable, secure solutions means they will have the best possible WordPress user experience available on any cloud marketplace. We are delighted to announce that Automattic, the expert in WordPress and creator of WordPress.com, has partnered with Bitnami to provide the official WordPress image to the AWS Marketplace. 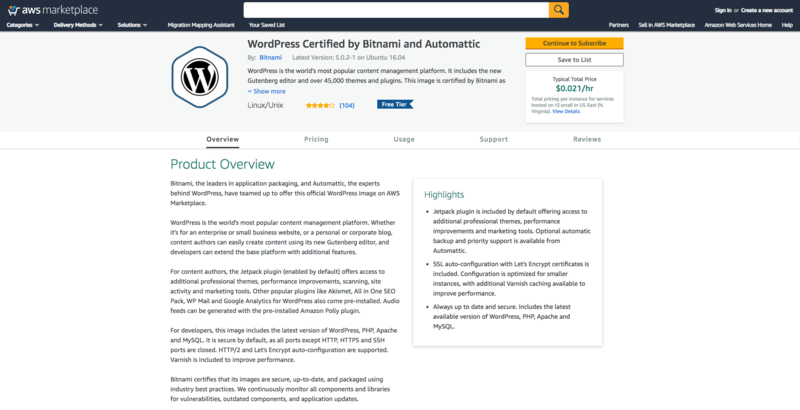 The Official WordPress image, “WordPress Certified by Bitnami and Automattic,” is now available on AWS Marketplace. This new marketplace listing includes the Jetpack plugin giving users access to additional professional themes, performance improvements, scanning, site activity and marketing tools. The listing also includes the new Gutenberg editor. WordPress Certified by Bitnami and Automattic is the first step in supporting WordPress in the AWS Marketplace. Soon, you’ll see tutorials, webinars and other materials to help you get even more out of your WordPress implementation. Stay tuned for more updates about this partnership by following us on twitter or LinkedIn!